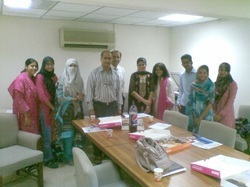 The second Discover WIE session as held at UET Lahore on 19th May, 2011 at the ‘Footsteps of Illustration’ event by IEEE UET, Lahore. The speakers representing IEEE PWF was Chairperson Mehvish Zahoor Newsletter Editor, Rabia Khalid (IEEE Karachi Section) who is also Chairperson IEEE PNEC NUST Student Branch. They gave an enlightening presentation on benefits of IEEE especially for undergraduate students. Rabia Khalid highlighted the differences between Google and IEEE and explained how IEEE holds an upper hand with over 60,000 patents. She also explained IEEE networking and the opportunities that come with it. The Best WIE Group Photo Award has been initiated under the leadership of Mehvish Zahoor (IEEE Lahore Section) and will be managed by Sana Syed (IEEE Karachi Section). The objective behind the project is to encourage team interactions between WIE student branches and hence, IEEE PWF is conducting a Group Photo Contest. Each participating WIE team is to send an innovative group photo to IEEE PWF. The photos will be presented on the IEEE PWF facebook page and a contest will be officially held. The IEEE PWF board members will help in deciding the winner. The winning team will be featured in the 2nd IEEE PWF Newsletter and will be presented a Best Group Photo Award.